The first Calypso was built in 1957 by John Forbes and Bob Osburn, from plans by Buzzy Jacobson, an outboard boat builder. It was originally planned to be a 225 cubic inch hydro, but about that time a new class was created - the 280 cubic inch stock class. Since this class would be cheaper and could run a 265 Chevrolet engine, which Bob was familiar with, the boat was changed to a 280 hydro, and received the low registration number of E-9. The first part of the year was spent on testing and changing things to make the boat run properly. 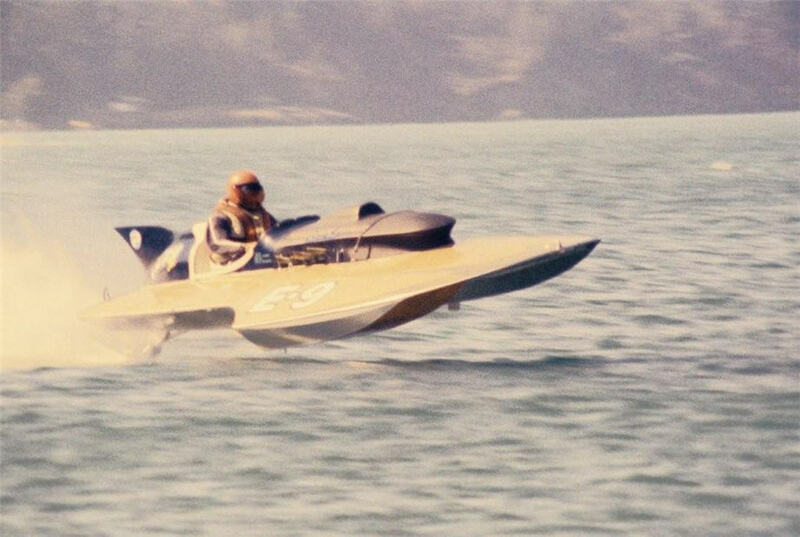 When the boat was finally entered into competition, most of the races were with 225's, as there weren't enough 280's in the northwest's Region 10 at that time. 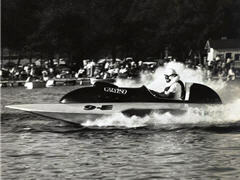 The second year saw the Calypso competing with boats and drivers such as the Wee Wahoo and Mira Slovak, Hy Power with Rex Manchester driving, the Thrifty Chevalier with Billy Schumacher, and the Huligan with Bob Reuss. 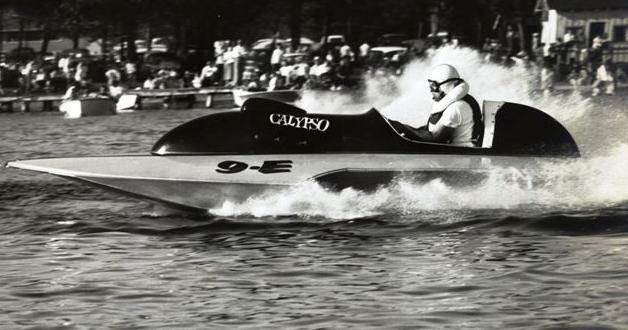 During the 1958 Nationals held on Lake Washington, the Calypso placed second in the 280 class with Bob Osburn driving and fourth in the free-for-all against 7 Liters, 266's, and 225's. After the race, the engine was torn down for inspection and found to have been running on only seven cylinders! At the close of the 1958 season, John and Bob sold the boat to a fellow in Pasco, and started building a new hull. A lot of work was put into the boat, bleaching and staining the deck, then fiberglass over the wood. Osburn even built the cowlings himself. This boat was called the Calypso Too and retained the E-9 number. 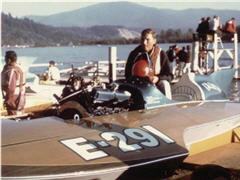 Bob Osburn drove the Calypso Too for about three years until the press of business caused him to retire from racing. After the boat gathered dust for over a year, John bought out Bob's interest with the help of brothers Ray and Jim and brother-in-law Lloyd Hawkinson. They got the Calypso Too back racing again with an ex-266 driver named Jim McGuire, but with less than impressive results. Then, in 1964, John put a young fellow named George Henley in the cockpit of the Calypso Too. For about three years, "Smiling George" as he was called by the crew, drove with great success. With the mechanical help of one Frank Schneider, who also joined the crew at that time, George and the Calypso Too in one season won five out of seven perpetual trophies with a total of twenty-five trophies for the year. In 1966, George acquired a 225 Jones conventional hull and started racing it as the Miss Tide Aire. So, near the end of the season he quit the Calypso Too ride. Thanks to George's recommendation, Frank took over the driving duties for the remainder of the '66 season, and all of the 1967 season. At the end of that year the hull was retired and John, Frank, and crew built a new Calypso. This third boat was also called the Calypso Too and given the team's traditional E-9 number. It was built from plans drawn by Frank and looked much like the second boat, but was faster. 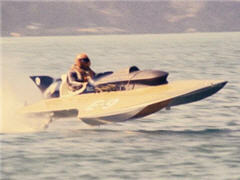 It ran for three years - the first two, '68 and '69, the boat ran with the top four. In the winter of 1969, John offered crew member Brian Parker an opportunity to drive the older Calypso Too, which had been in storage since 1967 when the new boat was built. Since that new boat was called the Calypso Too, the older boat was renamed simply the Calypso and given the number E-291. 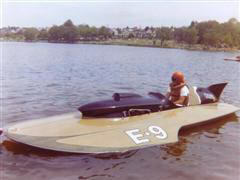 John had purchased a new Plymouth engine and wanted to use the older hydroplane as a "test" boat. So, while Frank continued to drive the highly competitive Calypso Too with the popular Chevy engine, Brian drove the Plymouth powered Calypso. Eventually the team perfected the setup of the Plymouth engine. In 1970 they replaced the Chevrolet engine in the Calypso Too, with a Plymouth, and made some sponson modifications, as well. With Frank at the helm, and the new Plymouth power plant, the Calypso Too went on finishing the season with 32 races and 2,000 points over the second place boat for National High Points, thus giving it the "E-1" designation. At the end of the 1970 season, Brian's career forced him to move outside the area. He ran a few races in 71, but had to quit racing early that season. John then sold the older Calypso to Armand Yapachino, who ran it as the Joya Mia the next season. At the beginning of 1971 Dr. Keith Peterson bought into the Calypso organization with a new Karelsen hull, and changed the colors from blue to red and white. 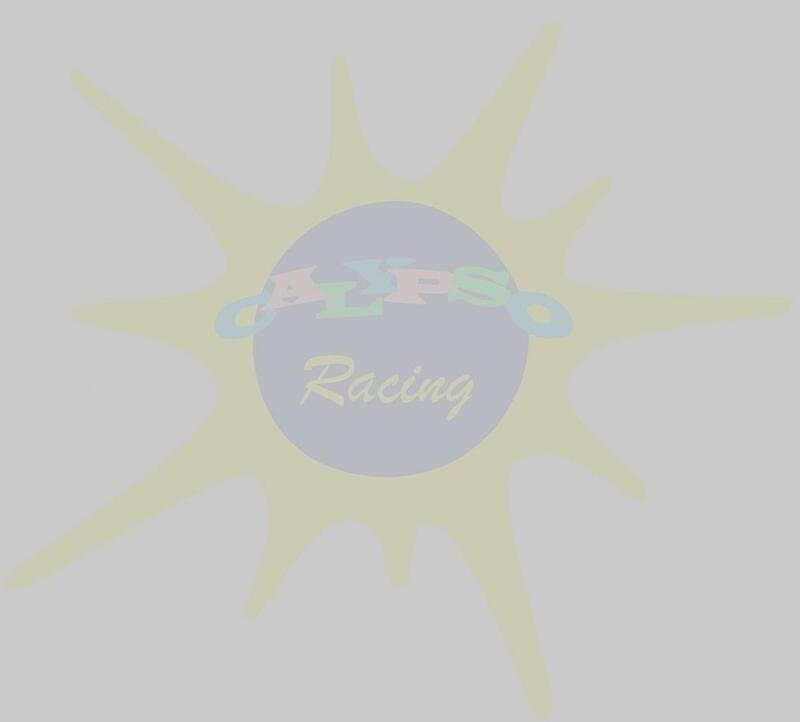 The "New" Calypso Too started off the 1971 season doing very well, winning a good share of the races, and competing with John Leach in the E-101 Buccaneer for high points. Memorial Day at Green Lake, the "New" Calypso Too, with Frank Schneider driving, broke the competition record held by Pat Berryman (in the George Babcock owned E-222 Colonel Bogey), by averaging 79.929 miles per hour. This record held for just two weeks, until Al Curtis in the Gladiator upped it at the Western Divisionals at Dexter Dam. During the 280 finals at Dexter, Frank went all out, trying to recapture his record. In the first turn after the start, the "New" Calypso Too took to the air, flipped, and came down hard, putting an end to the new record try. After a lot of hard work by the Calypso crew, the boat was back running in two weeks and winning races again. 1972 saw the "New" Calypso Too in retirement again, with Frank and Doc Peterson quitting the racing game. In 1973, John and his brother Ray bought out Doc Peterson's interest, and the "New" Calypso Too E-9 was back racing again with Lloyd Hawkinson back as Mechanic. The boat finished out the season, barely keeping with the front runners, using a variety of drivers and a prop that didn't push the boat fast enough. 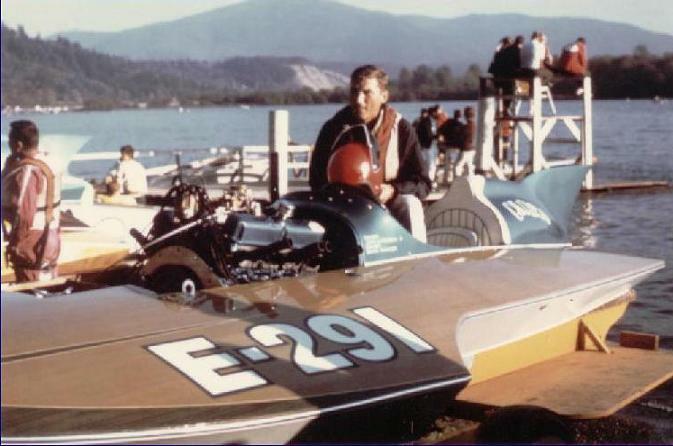 Starting the season of 1974 with a new prop, the "New" Calypso Too won the first race at Lake Sammamish with veteran 150 driver, Skip Meridith at the wheel. The second race at Green Lake on Memorial Day saw a repeat of Dexter Dam, the boat running fast but going over in the second lap, breaking it up, but fortunately not the driver. The Forbes brothers decided not to rebuild the boat, but ordered a new cabover from Ed Karelsen instead. The fifth boat, called the Calypso Too, was finished in time for the 1975 season and got off to a pretty good start. 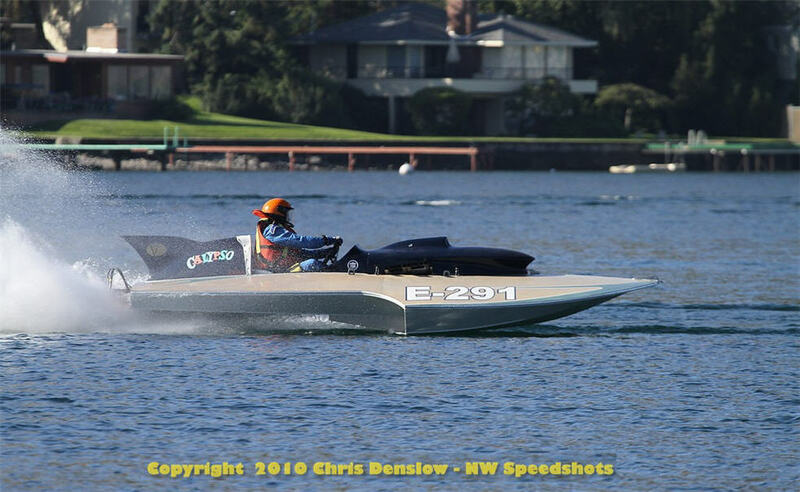 With Don Benson driving, she did quite well, taking first place at the Western Divisionals at Harrison Hot Springs, and fourth at the World Championships at Green Lake. The second season showed a mixture of first, second and third place finishes, as well. In 1977 the wheel was taken over by a young Chip Hanauer. On top of winning the National Championship Race at Castaic, California, Chip and the Calypso Too took High Points Champion for the season. 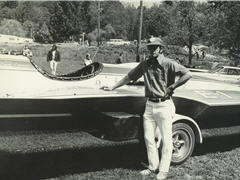 At the 1978 Memorial Day Race on Green Lake, Chip ran the Calypso Too over the record, posting a speed of 88.235 m.p.h. 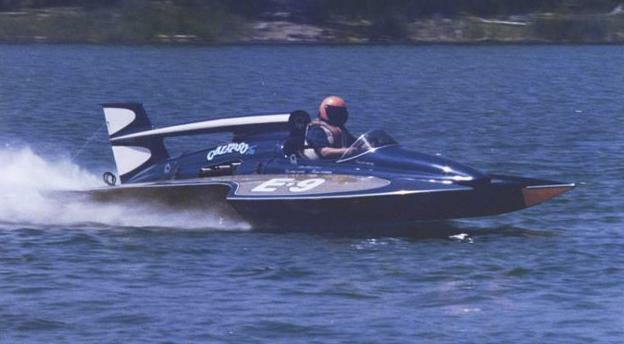 Later that season, Chip stepped up to pilot the unlimited hydroplane Squire Shop, and turned the Calypso Too driving duties over to Mike Campbell, who finished up the 1978 season and drove all of 1979. Starting the 1980 season in the boat was a young John Karelsen, son of the boat's builder. 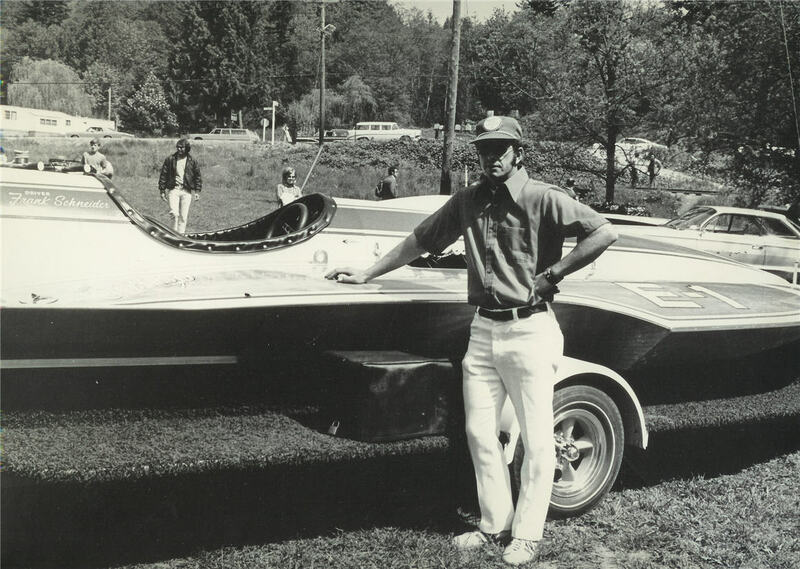 John had some success driving the Calypso Too, but his passion was the outboards. Sadly, he was fatally injured while testing one of those outboard hydroplanes. took over driving the Calypso Too in 1981, consistently finishing in the top four. 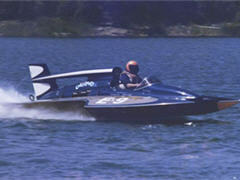 Terry Troxell drove the boat in 1982 with similar results. , thus ending the Calypso era. * The 1971 Karelsen hull (originally the "New" Calypso Too) was acquired in 2006 by Jeff Schneider, who's dad Frank drove the boat in 1971-72. Jeff and Frank completed restoration of their hydroplane in late 2012 and are running it in the Region 10 Vintage circuit. * In October of 2008 the second Calypso hull was found and purchased by Don Kelson who has since rebuilt it from scratch. Don ran the boat on the Region 10 Vintage cicuit in 2010 with his son Jerry Kelson and Steve Parker sharing driving duties. 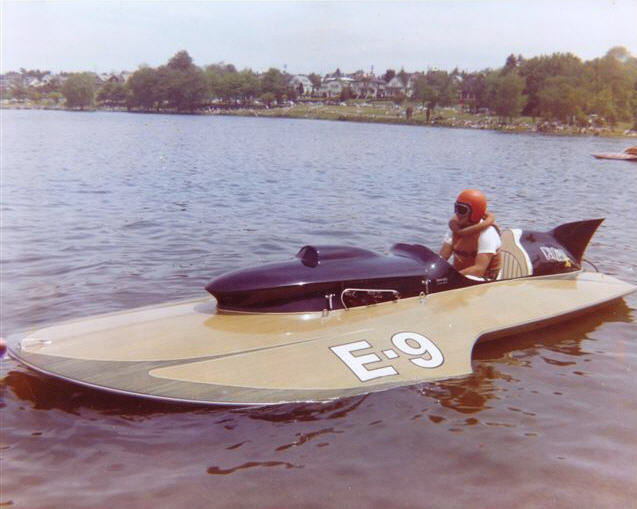 In early 2011, the sons and daughter of Brian Parker (who drove this Calypso) purchased the hydroplane from Don and are currently running it in the Region 10 Vintage curcuit. * In November of 2011, Don Kelson located and purchased the first Calypso hull. We're excited that restoration will begin later this year. So, we are successfully running two Calypso's, and hopefully a third one will be hitting the water soon. 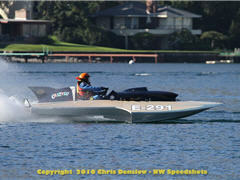 Our goal of having a full fleet of original Calypso hydroplanes running the Northwest vintage circuit is coming true!